Yay!! it's here.. we are so excited to show you TAWS FEB stamps.. (We now accept CREDIT/DEBIT CARDS TOO) woohoo... We also have our freebie for you to play with.. since it is the first WED of the month..
before I get to the amazing sets for this month.. 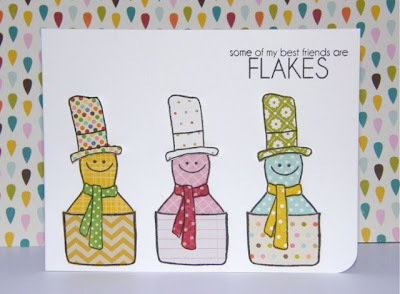 I wanted to tell you something fun we are going to be doing each month.. Each month on our Facebook page all month long, you can post pictures of your creations using your TAWS stamps or the freebies we provide.. at the end of the month one random person will be a lucky winner who will receive a stamp set of their choice. There is NO max, you can upload as many as you want!! So get creating and upload those creations!! 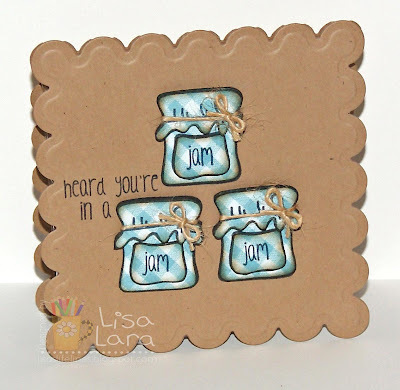 -Background Basics: yep.. it's just that.. the best basic background stamps that any stamper/crafter needs to have.. these stamps are so versatile and add such a fun flair to every project.. they really are a must have. 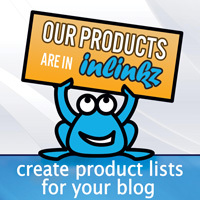 Crazy Critters: I just love critters.. I can't tell you how much fun I had designing and creating this set.. 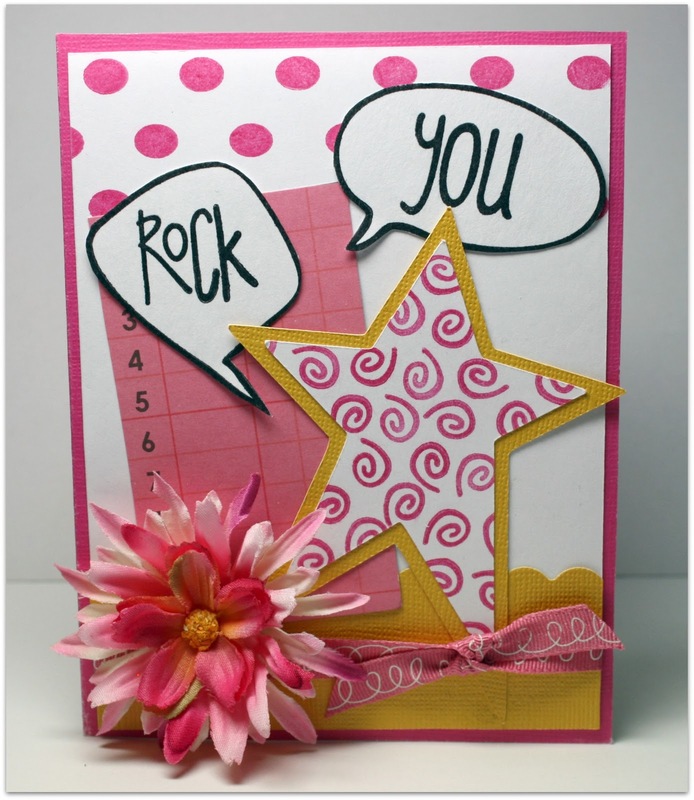 It's a perfect set to create scenes or a quick CAS card with the perfect sentiments to go along with every image..
Talk to me: okay this is such a fun set.. who doesn't love talking bubbles?? 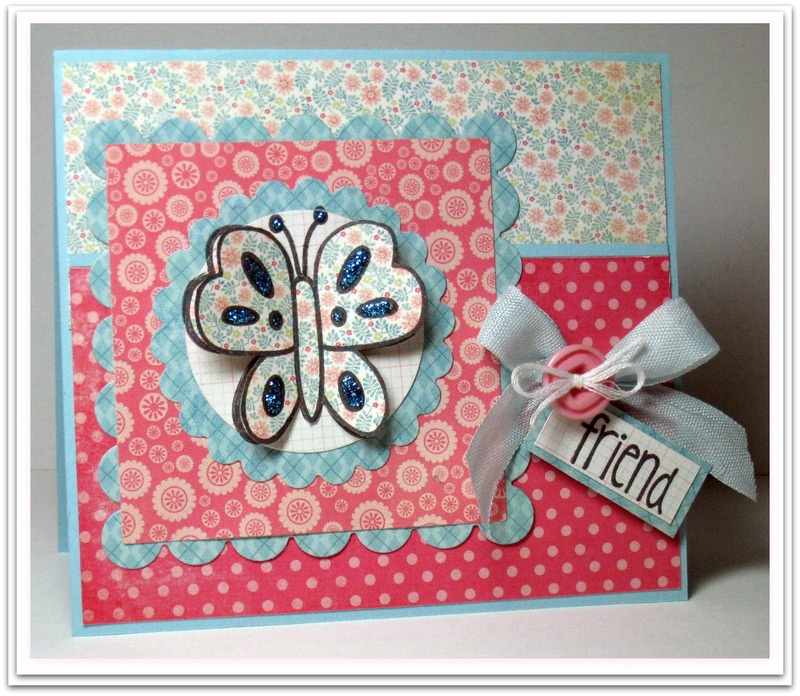 BUT.. here is the great part.. they are all mix and match.. every sentiment inside the bubble is separate.. so you have 7 talking bubbles and 10 separate sentiments.. :) it's such a versatile, fun, and great way to add a sentiment to any layout, card, or creation..
this is the last day for sneak peeks.. Tomorrow these new stamps will be available for you to purchase.. 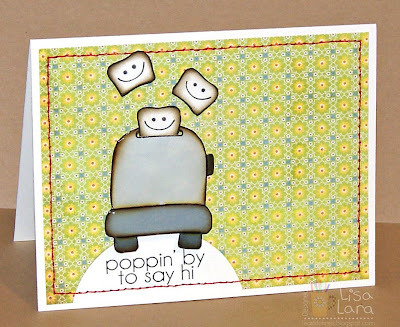 I can't wait to see the crafty things you all come up with..
Marcy created this amazing card using the new Talk to Me set.. it features perfect word bubbles and words to go along with it.. She also used the dots Background Basics stamp.. Love the pink and yellow together..
Lisa brings us a creation with a vintage feel. She also used Background Basics. Love the look of it heat embossed on kraft. 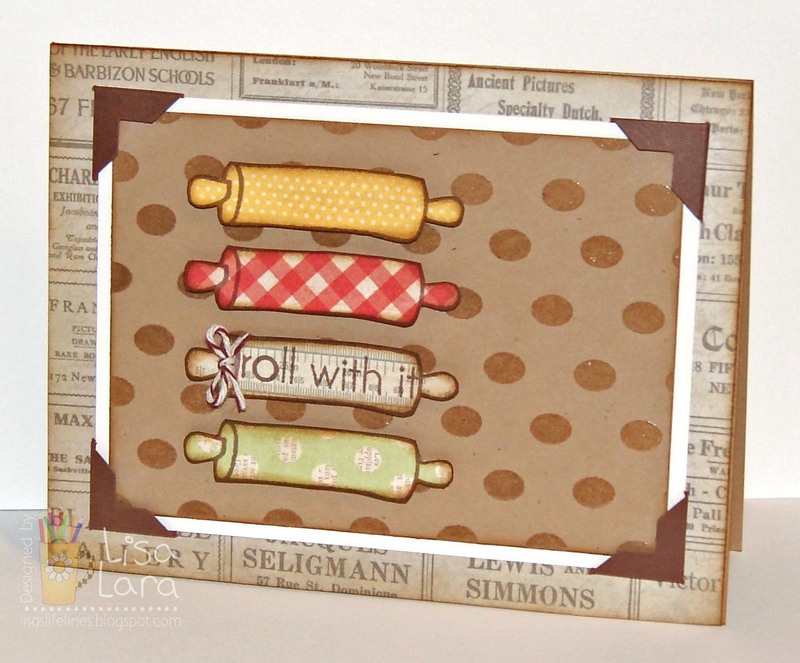 Her paper piecing gives a pop of color with these cute rolling pins from the Kitchen Gadgets set. 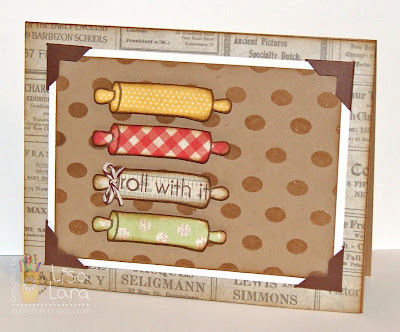 I adore the way she put the sentiment on one of the rolling pins, and added some twine to bring your eye to it!! how fun! It's Behind the Alley for the next 4 days.. and we are ready to share with you samples and give you a little sneak peek of what February's release holds.. 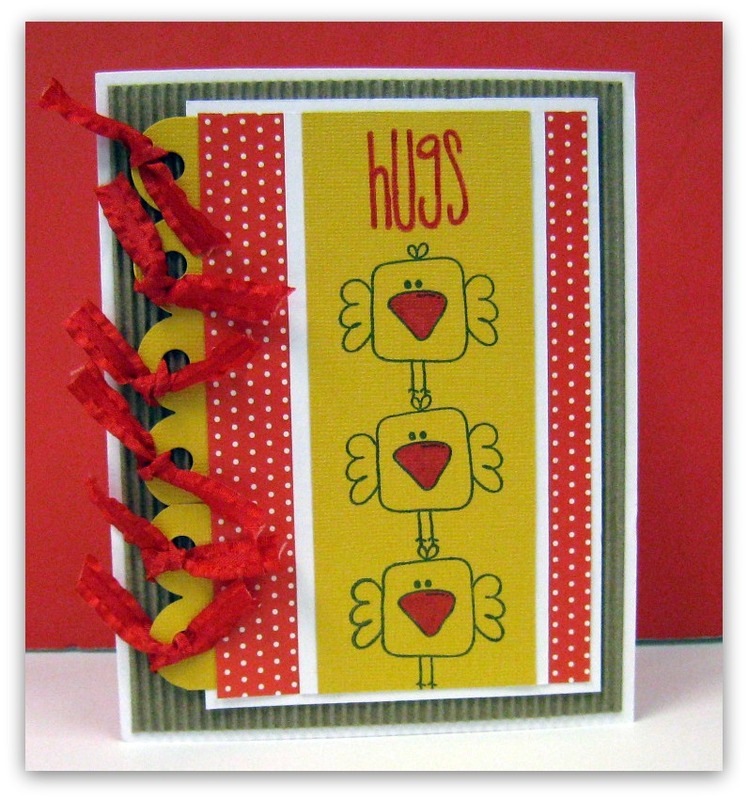 There are THREE NEW sets from The Alley Way Stamps that you can buy on February 1st in our shop. 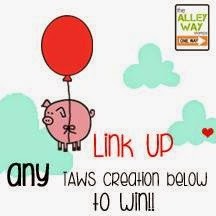 You want to come back each day this week to see more creations from Behind the Alley.. you won't want to miss this..
( you can pick and choose which ones you want to do.. but the more you comment the better chance you have to win) THREE people will picked to receive one of the new sets! You have until Jan 31st to leave comments. Retro anyone? 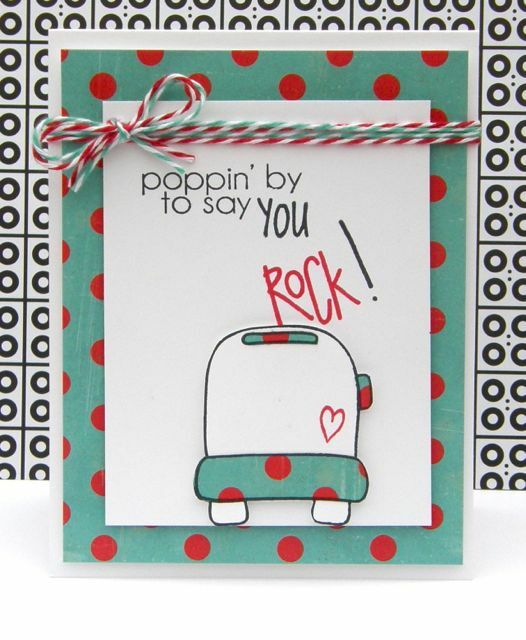 I love the retro feel this card has with the teal and red (one of my favorite color combos) Annette is Poppin' by to share a little creation Kitchen Gadgets and Jibber Jabber stamp sets. With a little added twine and some cute polka dots. Don't you love how she has her words poppin' out of that toaster :) YOU ROCK Annette..! 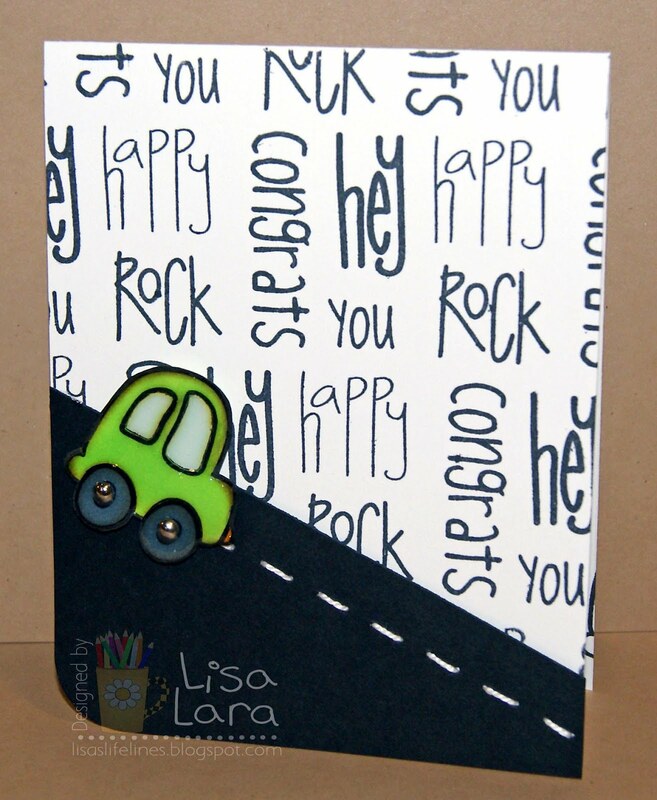 Barb's created a CAS, graphic card to showcase the cool car image from Priceless Joy. To show movement of the image, she's just stamped off the ink! 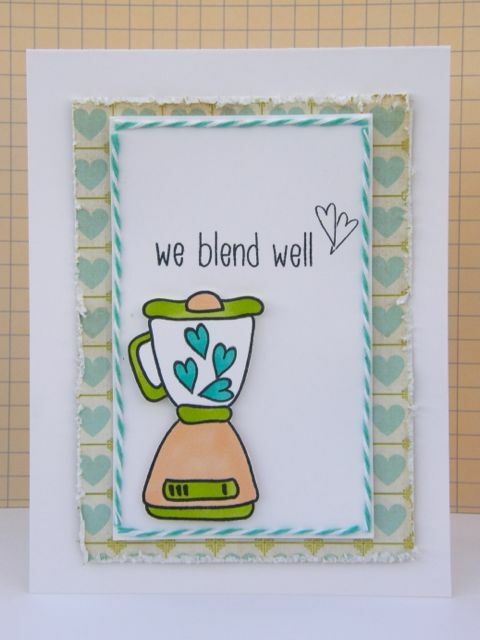 The sentiment, from Kitchen Gadgets, was stamped on a black cardstock banner then heat embossed in white. By adding some matte black rhinestones and rounding a couple of corners we can say this cute, CAS is done! 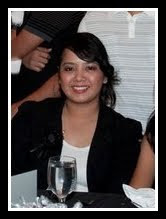 :) LOVE IT!!! Marcy has used the adorable car stamp too.. 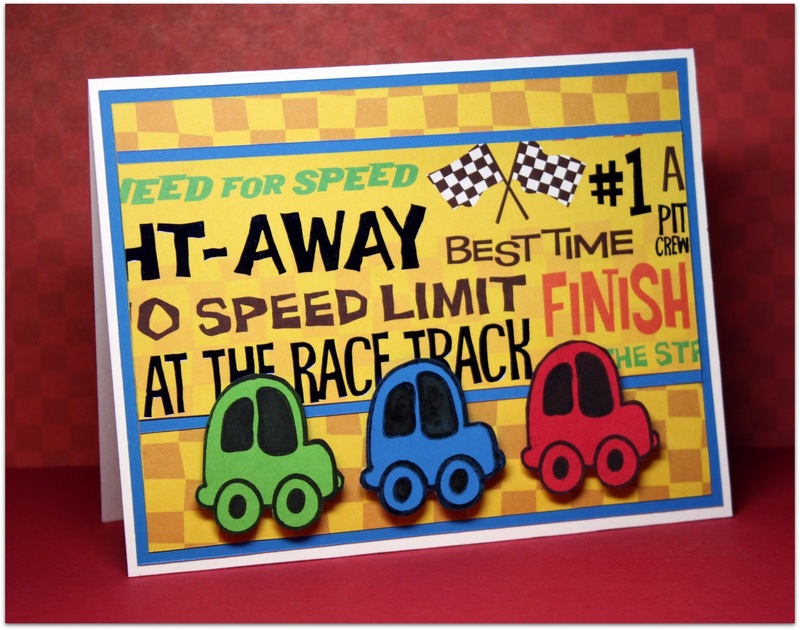 I love the speed way feel of the race track.. don't you just think this would be such a fun little boy card.. loving the primary colors..
come back tomorrow to see some more designs.. :) we are getting so close to our hop on THURSDAY!!! we have some exciting news.. 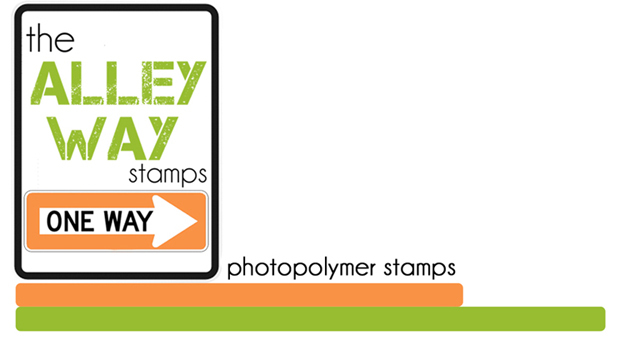 The Alley Way Stamps is now on FACEBOOK!!! Yes! You heard right..and to celebrate we are going to have a stamp giveaway.. We already did one giveaway for the first 50 likes.. but we got that in just half of a day.. so we decided to do another one for all those who would like to join in.. so we will give away another stamp set, as soon as we reach 125 likes.. all you have to do is go to ourfacebook page and like us..yep that's it.. as soon as we reach 125 likes.. we will give a stamp set to one random winner.. :) what are you waiting for? go LIKE us!! 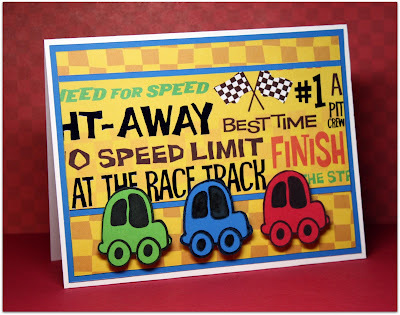 don't you just love how playful this card is. 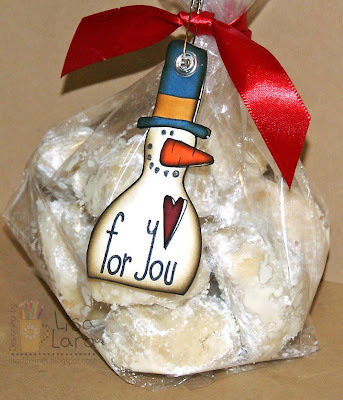 One of my favorite things is that all TAWS can be used together to create your one of a kind scenes like Laurel did here.. don't you just love those clouds in the background too..
Barb created a scene using the adorable snowman from Snow Much Fun. 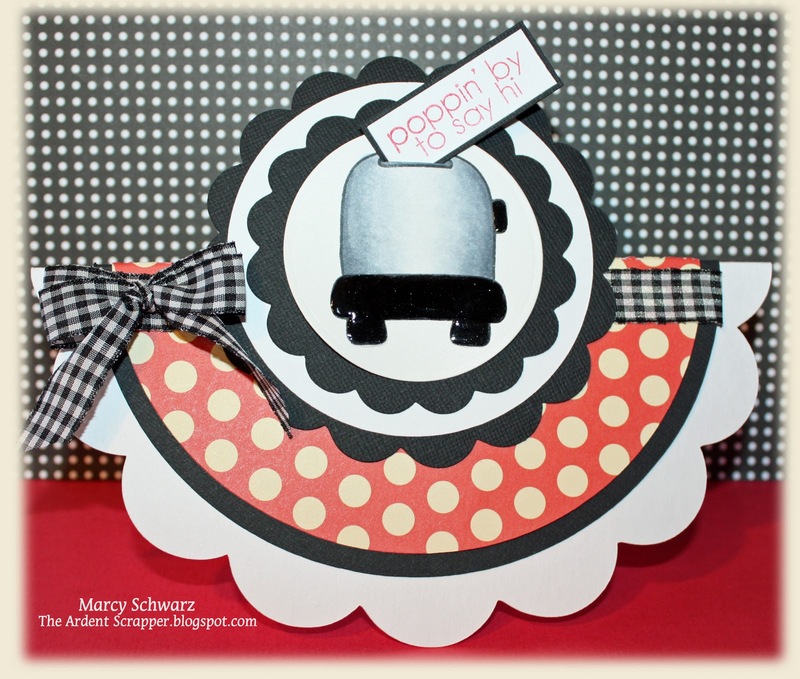 The scene was built using cardstock stickers from a popular paper pack you may already have at home. 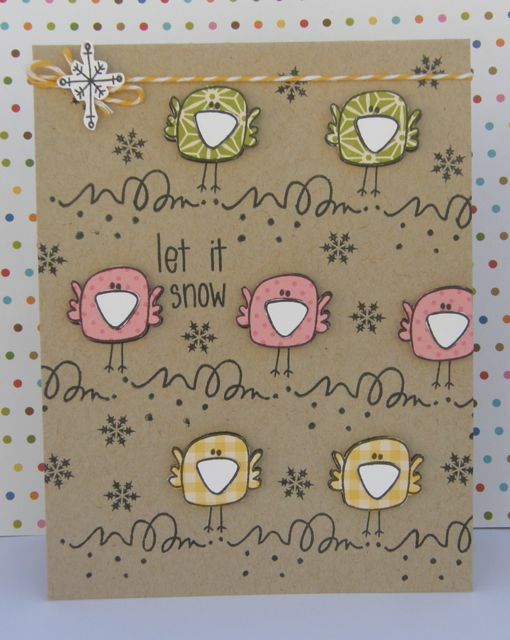 The snowflake and swirl images also from the Snow Much Fun set were stamped on the sentiment banner to make it part of the scene. 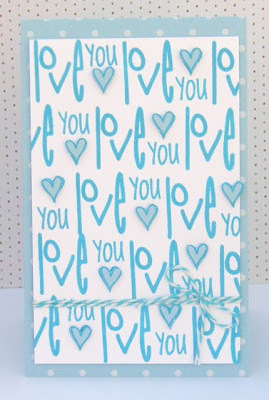 A puffy, baby blue gingham bow, adorned with a handmade button and jingle bell sit on a bed of felt snowflakes to finish off the card! 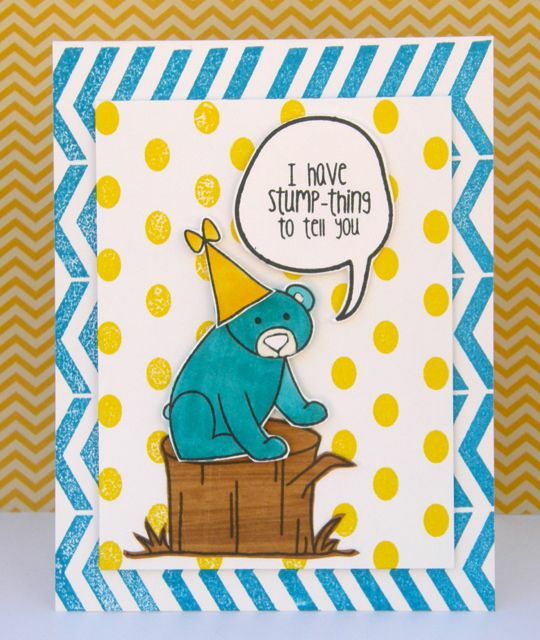 This is the perfect card to ring in the new year. 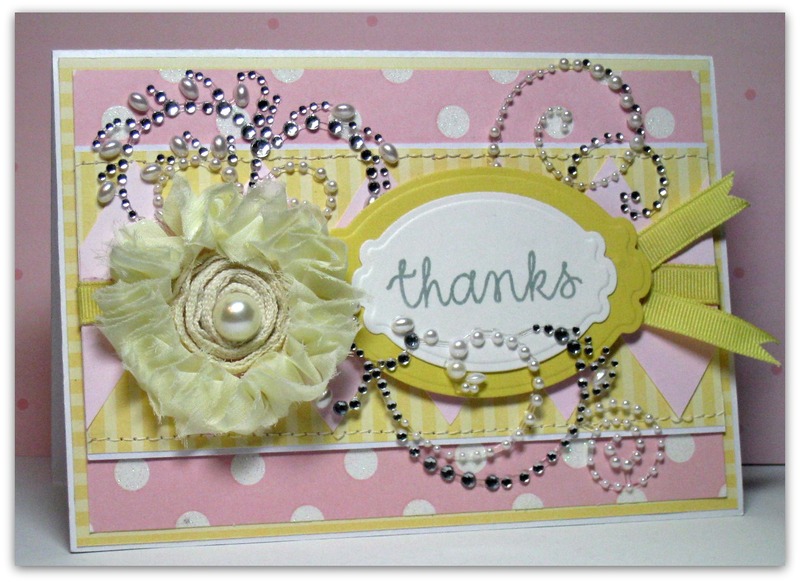 effect would be soft, she then added loads of bling and a big, sumptuous flower for that really girly look. 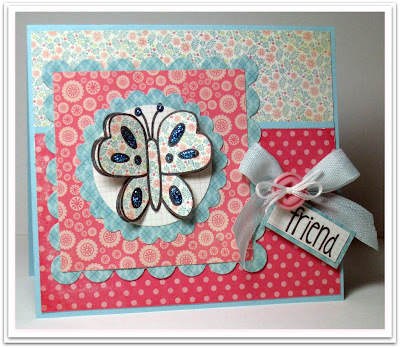 I love the soft yet stunning way she made this card. Who doesn't enjoy carrying on with friends? 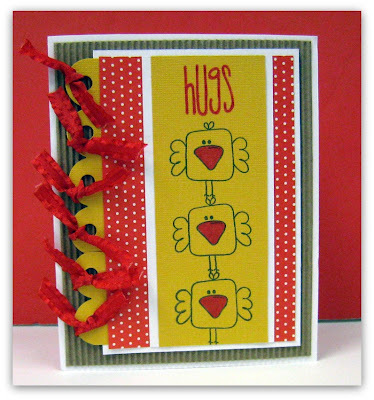 Barb has created a card full of chickies who seem to be acting the fool to make us laugh today. Ear muffs as...a beak warmer? A top hat about to fall off one chickie, while another is blinded by his scarf. Then there's the chickie on stilts hovering over the last chickie using the snowman's arms as antlers. Too fun! Felt snowhills layer the scene, and yellow twine tied in a bow brings your eye up to the punny sentiment...which sums up our little scene quite nicely! :) I just love how she has combined the images to make such a fun card. Lisa has created a fun CAS card using KITCHEN GADGETS and JIBBER JABBER sets. Sh used black and white throughout her card with just a pop of color. 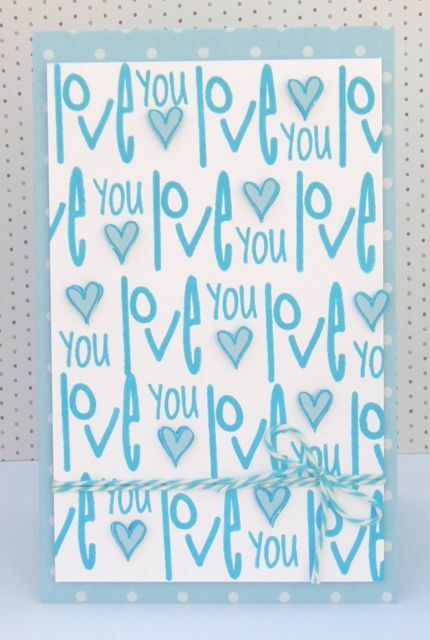 I love making just one word pop off a card. Very effective. 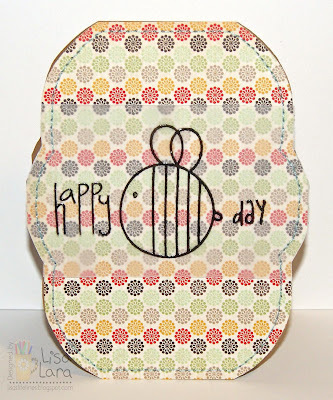 Love that popped up scale and twine french knot accents. So fun! 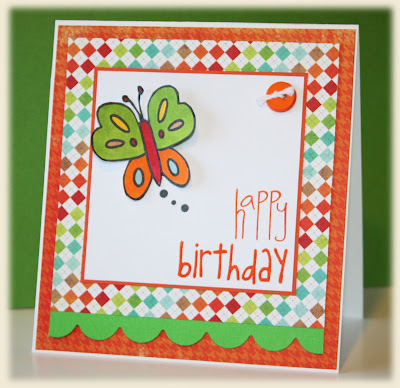 I love how she cut out the butterfly and popped it off the card. 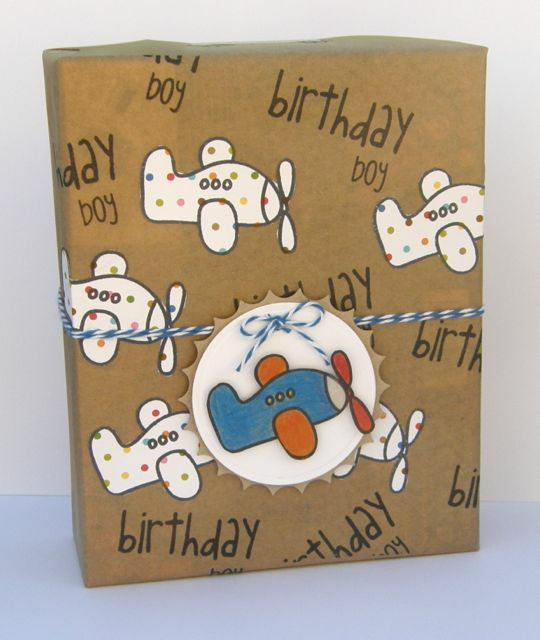 That little button and twine is a perfect finishing touch. Today we have some Priceless cards for you. 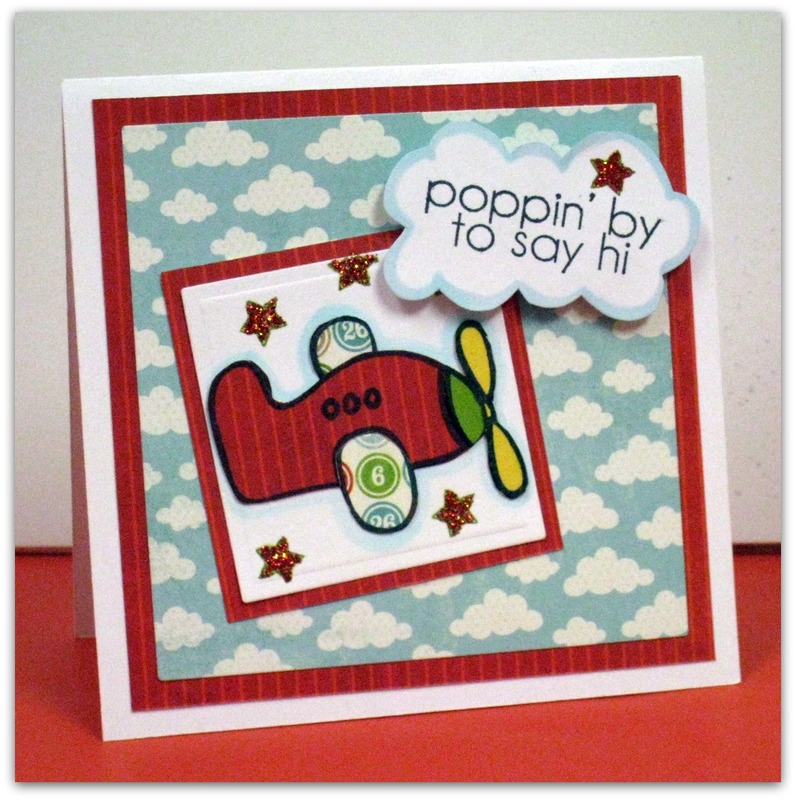 Laurel has used the airplane from Priceless Joy set and did some paper piecing with it. Don't you just love how she stitched the background, and used squares to "tie" them together.. :) The plane, banner and clouds are mounted with some foam squares for some dimension. Finally, all tied off with a bit of twine. Perfect for a little boy in Laurel's Grade One classroom. 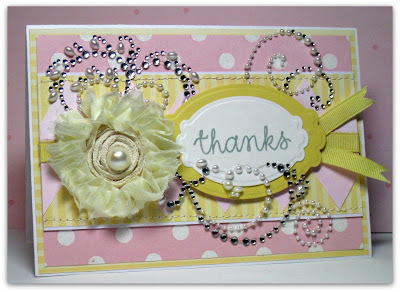 oh how I love little ones.. this is just the perfect gift card holder created by Marcy , she used the priceless joy set. 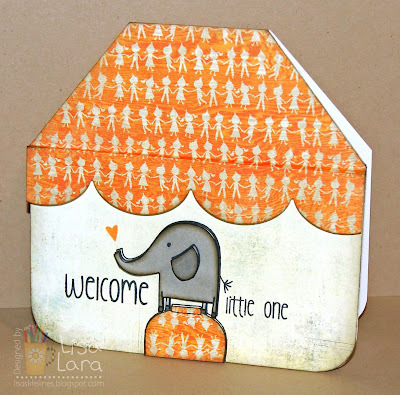 Don't you just adore that little elephant with the brown ear, and placing him inside the circle is perfect.. the fun buttons on the side of the sentiment really adds such a whimsical feel to this. 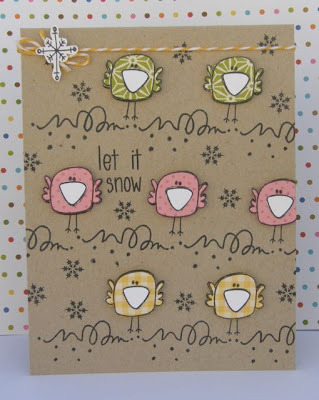 Annette created this cute card using our new Snow Much Fun stamp set. 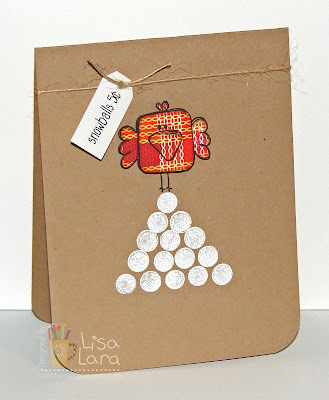 I just LOVE how she paper pieced our little bird in all different colors of patterned paper. 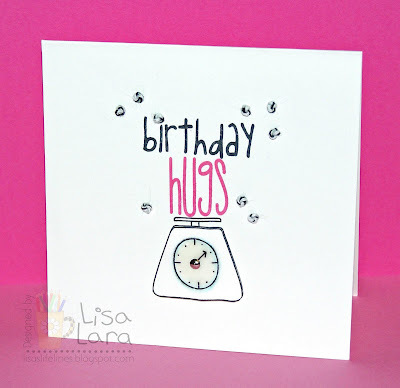 Don't you love how she used the snow swirl to really ground them to the card.. 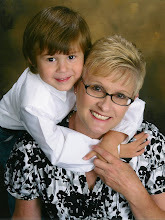 I just love kraft, so anything on kraft is something I am going to aww over..
Barb is joining us for the first time today! She made use of bright colors, funky shapes and a punny sentiment to make the adorable bee image from Priceless Joy the true focal point of the card. Look at all the texture and different layers. Highlighting the versatility of our stamps, the stacked sentiment was built using stamps from Priceless Joy and Jibber Jabber. Doesn't it tie everything together perfectly? 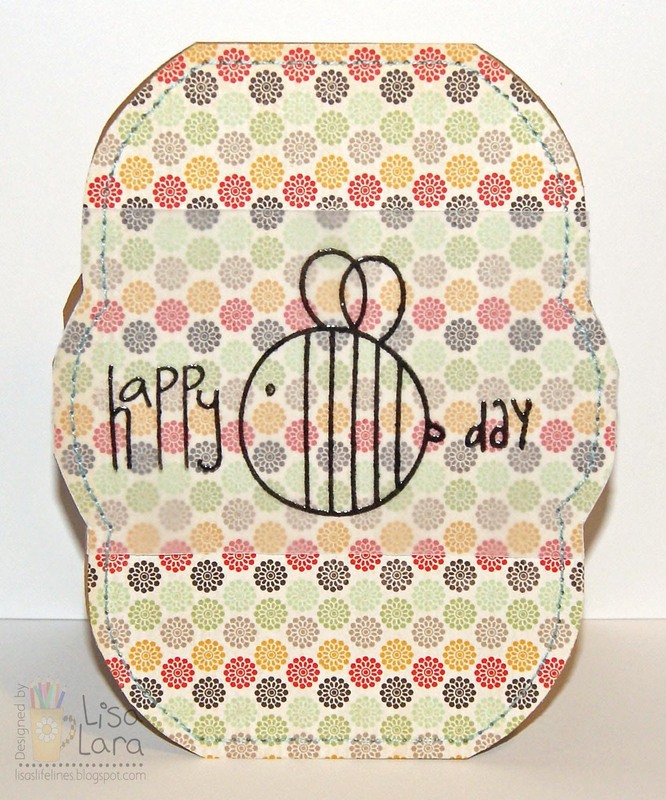 I just love the way she put the googly eye on the bee to give it that added "fun" feel... and who doesn't love little wings with some glossy accents..
Any Shaped card has a soft place in my heart.. and this one is one of those.. Marcy created this adorable card using the fun toaster image from Kitchen Gadgets. She colored the image with copics and added a thick layer of Glossy Accents to make the black parts dimensional and shiny. 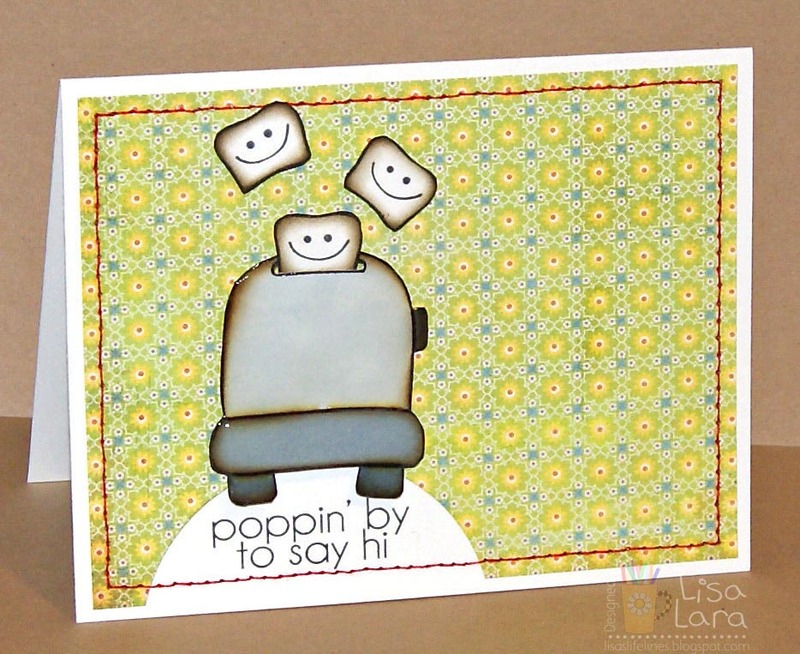 Don't ya just love the way the sentiment is "poppin' out" of the toaster? I love how she pulled the black into her bow. 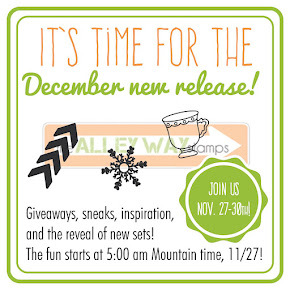 I hope to see you tomorrow.. when we show you more inspiration using the Jan release..